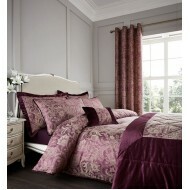 Add glamourous sophistication to your room with this indulgent bedlinen collection. Style with..
Dorma Cecile Exquisite in shimmering gold this fine and elegant beautifully detailed woven jacqua.. The name Catherine Lansfield, embodies cool contemporary designs for 21st century living,e..
Luxurious beautifully designed bedlinen, with charming woven jacquard detailing in calming, natural ..
Luxurious beautifully designed bedlinen with intricate embroidered detailing in calming,natural tone..
Pillo A beautifully classic jacquard in glamorous rich plum and gold tones with sophisticated and.. This beautifully designed master bedroom collection is crafted with luxuriously soft fabric and encr..
Fine easycare bedlinen with geometrical heat set detailing to add luxury designer styling to your be..
High fashion design with a touch of 1930's glamour, this beautiful bedlinen combines champagne velve..